Are you planning on buying a diamond pendant? BAUNAT offers you an extensive collection of contemporary pendants, set with beautiful diamonds. We offer various designs: from a butterfly or satellite design to a halo, you will definitely find the pendant that suits you perfectly. BAUNAT only uses the best materials: 18 carat gold (75% gold, alloy 'Au750') or Platinum 950 (95% platinum, alloy 'Pt950'). 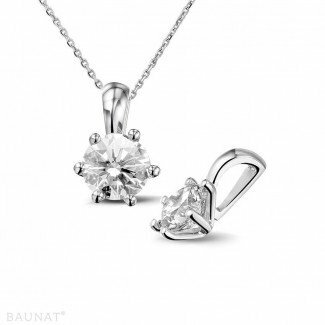 BAUNAT offers diamond pendants, diamond necklaces and diamond lockets. 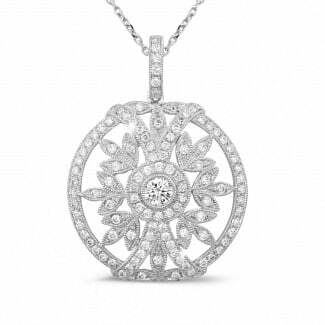 When you are wearing a diamond pendant by BAUNAT, you do not only radiate elegance but also an attainable beauty. Between the various jewels on the online website of the jewellery brand BAUNAT, you will find numerous pendants in different shapes and colours, as in red-, yellow-, white gold and even platinum. At BAUNAT, you enjoy the freedom to choose between all possible diamond pendants, which can give your look an extra touch. With the online collection 24/7 at your disposal, you can find models manufactured in platinum or gold (yellow, white, red). In addition, there is the option to create your custom made jewel which can meet your specific expectations. Regarding the various forms of the pendants, there is also a wide range you can choose from between the several models that BAUNAT has to offer, such as a heart shaped pendant, a flower-shaped or star. The size and amount of diamonds is completely up to you to decide, depending on your taste and budget. This way you can opt for a fine discrete pendant or an impressive diamond which complements your outfit. 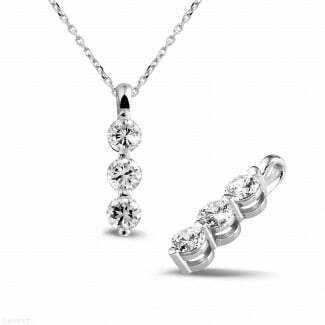 When buying a diamond pendant at BAUNAT, you benefit from the best price/quality. In Antwerp made by hand, using the best materials, you will be fully satisfied. The price varies depending on the model you choose and the origin of the used diamonds. As for the quality of the service, the supply is within 7 working days and is completely free of charge. On top of that you enjoy a 20-year guarantee on all jewellery you buy at BAUNAT.